POWER Surges are pop-up showcases around the metro Detroit area, where talent compete against one another for a chance to make it to Detroit LIVE. Each month from December 30, 2016 through May 2017 we will host several POWER Surges showcasing various genre’s of music. The top 3 winners from each SURGE will advance to the semi-final round. From there the top 12 acts will be announced and move forward to Detroit LIVE, in which they will perform a set in front of a live audience in Downtown Detroit. 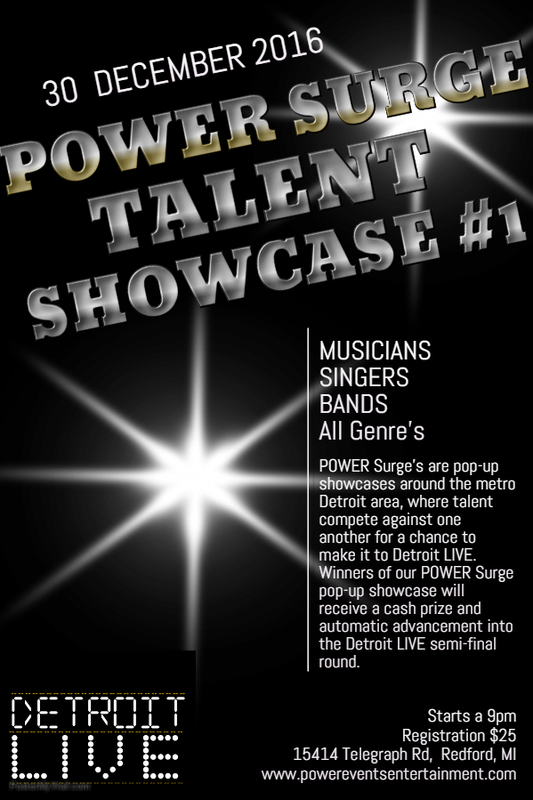 Winners of our POWER Surge pop-up showcase will receive a cash prize and automatic advancement into the Detroit LIVE semi-final round. If you are an up and coming artist or band, independent artist, touring artist – YOU DON’T WANT TO MISS THIS! The winners of the Detroit LIVE Power Surge Semi-Final will be signed to an exclusive deal with POWER Events | Entertainment which includes a Regional tour and so much more. Winners of Showcase will receive a cash prize. There is a fee to apply.